This is How to Make an Acoustic Guitar Part Sixteen and in this part of the series I will show you how to make binding strips. 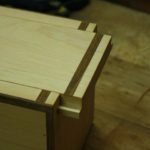 There is a little secret to making excellent binding strips, and once you know it you will be able to make them from any type of wood you like. Enjoy. It’s not difficult to make your own binding strips. All you need to know is the trick. When you buy your strips from a guitar making supplier, they already know the method. Now, you will too. On top of that, you will also save a ton of money making your own strips versus buying them. 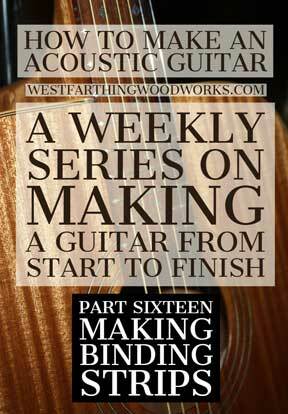 Acoustic guitar binding strips can be several dollars each, and if you dress an entire guitar plus a couple for mistakes, you might need eight to ten strips. At $4 each you are out $40 in the blink of an eye. For that same $40, you could buy a killer piece of really nice looking hardwood to make your own. On top of that, from that single piece, you might get five times the number of strips or more. In the above example, that’s $200 worth of binding strips for $40. 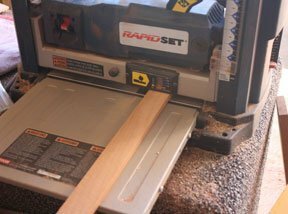 In order for this secret to work, you need to have the right table saw blade. This is a necessary purchase, and it will return the money from the blade the first time you make your own strips. 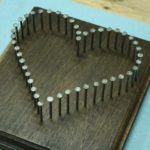 You will also get addicted to making your own binding, and love how you can make strips from anything you want. 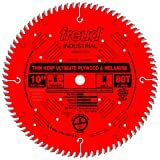 The best blades for making binding strips are fine cutting, finishing blades. These have a high tooth count, and they are also thin. The thinner the blade itself, the less material you will waste. When you think about how thin binding strips are, it’s easy to see how a regular blade can cause more than half to go to waste. The thinner the blade the better. Get one with a very high tooth count, and make sure that it matches the arbor size on your table saw. Use it for making binding strips only, and remove it when you are doing other things. If you do that, you can keep the blade for nearly your whole life, because you will end up using it only for the purpose of making binding strips. Not all pieces of wood are created equal for making binding strips. However, the majority of the pieces in the bin will fit the bill. 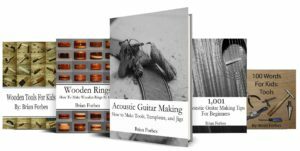 In a case where you usually struggle to find well quartered wood for guitar making, I am about to make it super easy for you. 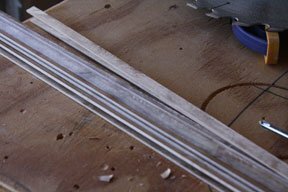 Because of the secret to cutting binding strips coming up later, you don’t need to find a quarter sawn piece of wood at all. In fact, you need to find a piece of flat sawn wood. The flatter, the better. This is the most common kind of wood in the bins at the hardwood stores, so you have a very easy task on your hands. When you find a nice, flat sawn piece of wood, you can use it the way I show you to make perfectly quarter sawn binding strips. 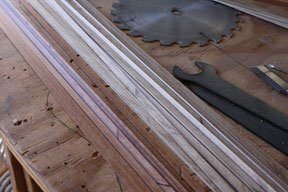 The reason you need quarter sawn strips is because they will not break as easily when they bend. 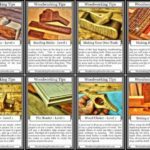 Flat sawn pieces will break a lot faster. Quarter sawn pieces flex more, and give you a better look on top of better bending properties. Finally, pick out a piece that is at least 5 inches wide, and as long as your binding strips need to be. For me, I look for a piece that is about 36 inches long by at least 5 inches wide. Look for a 4/4 thickness, which measures about 3/4 of an inch. The nice thing about this billet of wood is that it’s actually two billets. Binding strips are only about 1/4 inch tall, so you can actually get two billets from this one larger piece. All you need to do is cut the piece in half through the edges. This is no different than splitting open a piece of wood for book matching. If you are comfortable doing this yourself, then do so. If not, pay to have the woodworking store cut it open and flatten the faces. What you need to do is fillet the piece open, and then sand or plane smooth the faces where the saw went through. It’s fairly easy to cut this open on the table saw, and then run it through the thickness planer or drum sander. Again, if you don’t have the smoothing tools, pay the wood store a few bucks and they will do it. 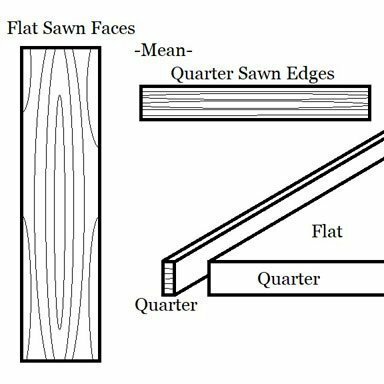 At this point, you should have two pieces of wood that measure the original length and width, but are now close to 1/4 inch thick or a little taller. These are your two binding strip billets. Now that you have your billets, it’s time to start sawing out strips. Depending on how comfortable you are, you can saw with the fence or make a jig to saw from the outside edge. 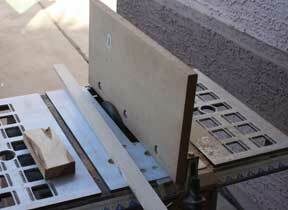 Either way, set up the saw to cut strips that are thicker than 1/16 inch but less than 1/8 inch. Look at binding strips that you have and try to hit that same thickness. Thicker strips are harder to bend, and thinner strips are too flimsy sometimes. Saw as many as you can from the piece of wood before you get to the point where it is getting too close to the blade. 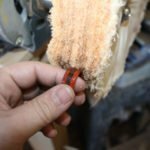 Make sure you don’t risk your safety for some extra binding strips. Get as close as you feel comfortable going, and then save the remainder for another project. Working like this, a 6 inch piece of wood should give up about 25 strips. Since you have two boards, you may get as many as 50 depending on your comfort level and cutting method/jig. By now you probably see that picking out a piece of wood that was flat sawn, and then sawing binding strips from the edge makes them quarter sawn. This is the part that makes all of the other parts work. 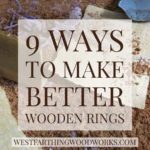 As long as you pick out the right piece of wood to start with, you can make your own binding strips easily and they will also bend really well. The grain will look good, and the pieces will be no different than if you were to get them from a guitar making supplier. Now that you have all of that great information, and you know the secret, you will be amazed at the opportunities that pop up for you. Next time you see an awesome piece of wood that would make killer binding strips, you won’t have to pass it by. Now that we have all the binding made, it’s time to bend them. Bending the binding strips is easier than bending the sides in some respects, but harder in others. Thinner and smaller pieces of wood bend faster, but they also break faster too. There are some things you can do to make the process easier though, and I’ll show you everything you need to know. 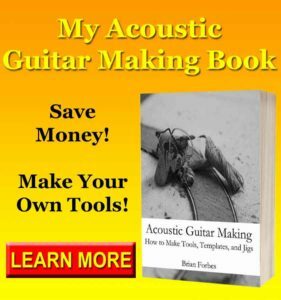 If you have any questions about How to Make an Acoustic Guitar Part Sixteen, please leave a comment and I will be glad to answer them. Happy building.